Bullis Charter School students take home top honors for their fluency in Mandarin Chinese at the state speech competition last month. 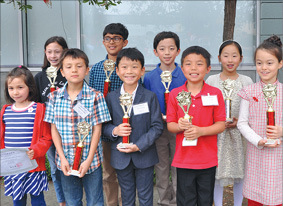 Bullis Charter School students participated in record numbers at the state Mandarin Speech Contest April 22, organized by the Chinese Language Teachers Association of California. Of the 31 Bullis Charter School students competing, eight placed first in their categories, with four placing second and 10 receiving honorable mentions. This was the school’s eighth year competing in the contest, which includes categories for students from first grade through college. Participants write their own two- or three- minute speeches and memorize them. Judges evaluate competitors on the accuracy of their Mandarin pronunciation and tones, fluency, speech delivery and content. While seventh-grader Anushka Srinivasan had studied Mandarin at Bullis Charter School for seven years, she only decided to participate in the speech contest after her family hosted an exchange student from the school’s sister school in China earlier this year. “When I saw that she understood my Mandarin conversations, I felt more confident,” Anushka said in a press release. Bullis Charter School Mandarin teacher Qinglin Yang and her team of five teachers worked with Anushka and other students during after-school office hours to prepare them for the contest. “The speech contest provides each student with a chance to excel in public speaking, to improve their Mandarin skills and to gain a sense of achievement through their hard work and practice,” Yang said. Third-grader Colin Chin, who has studied Mandarin since kindergarten, competed for the third time this year. After struggling with nerves during his first two competitions, this year he placed second in his age category. Fourth-grader Philip Oberheart had a broader goal for the speech contest. “In case I am the CEO of a company and do business with China, it will help me communicate with the people in China, convince them of my ideas, and help my social skills,” he said. In addition to Anushka and Philip, first-place winners included Ariana Poonen, Timothy Moon, Miles Sijstermans, Lillian Liu, Linnea Sheen Forslin and Allison Mitloff. In addition to Colin, second-place winners included Kaitlin Cho, Edan Cui and Jennifer Cruden. Students taking home honorable mentions included Ishaan Nambiar, Caroline Yu, Mia Sijstermans, Eshwar Vinnakota, Annabel Zhao, Maya Dutta, Aveline Lapetina, Elizabeth Cruden, Ava McClatchie and Annabelle Fu.